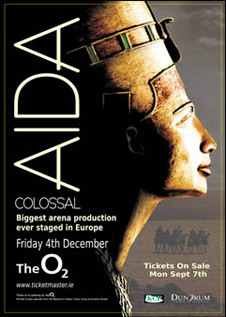 I'm fulfilling yet another "would love to do that" this weekend - stepping out on stage at the O2 in Dublin and Odyssey Arena in Belfast as part of the ensemble of Verdi's AIDA. This production will be one of the most spectacular versions of Aida ever to be staged and will appeal to both opera connoisseurs and novices curious to experience the delights of the opera for the first time. When I say "part of the ensemble", I mean part of the triumphal march in Act II, when the Pharaoh takes to the stage to meet his princess. I'll be one of the two fan bearers following him out and standing behind the throne. Oh, the glamour. Steph and Niamho are also taking part, thanks in part to taking the audition. Okay, okay, we just showed up. Still though, great way to spend a Friday and Saturday night - on stage at two of the country's biggest venues, listening to live performances from the stage in a spectacular production - "very much a first for Ireland as this production of Aida is larger than any ever done before." The production brings new meaning to ‘grand opera’ as The O2 will be transformed with spectacular sets and scenery and a cast of over 200, including 20 ballet dancers, will take to the stage in lavish costumes to perform one of the greatest operas ever written accompanied by a full orchestra and a choir of 75 singers. The O2 will be unrecognisable when the stunning sets are built for the show. A 12 metre high pyramid will dominate the stage, along with the throne of Pharaoh, and statues of Egyptian figures as well as eight palm trees. 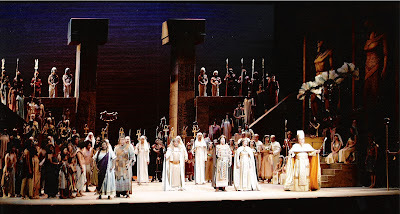 With principals including Rosella Redoglia as AIDA (previously Abigaille in Nabucco), Stefania Scolastici as Amneris, Ernesto Grisales, the Colombian tenor as Radames, Camilla Corsi as the Priestess and the Coro Lirico Italiano and the Sinfonica Nova Amadeus Orchestra conducted by Stefano Seghedoni, this is sure to be one of those experiences none of us will forget. I just need to work out how to stick the phone in the costume for a sneaky twitpic. Aida is set in ancient Egypt and tells the tale of Aida, an Ethiopian princess who is captured and taken into slavery in Egypt. While there she meets with Radames, the Captain of the Egyptian Guards, who falls in love with her. Radames becomes torn between his love for Aida and his loyalty to his leader the Pharaoh whose own daughter, Amneris, is in love with him. The story reaches a climax when Radames is asked to lead the Egyptian army into battle against the Ethiopian army headed by his beloved Aida’s own father, the King of Ethiopia. What an evening that will be. And such a unique way to experience the performance. Glamour indeed. Back a leg (but not your fan). I was at the show on Friday night and was extremely disappointed. The sub titles were so tiny and broadcast in white against a largely black and white background, they were pointless. What happened to the dominating pyramid? And as for the rest of the 'ambitious set', the changes were so painstakingly slow that people very noticably began walking out. Only the the tickets had been pricey, I would have been right behind them. I left feeling very cheated. was at the show, very poor production. Music. Orchestra, singing very good, just the production was really very poor. not slick in any way. Very disappointed from front of stage. I hope you enjoyed the experience of being involved in the show.